If a cute game is on your list, then Brightwood Adventures is just the thing for you. This little treat is definitely something that will keep the younger folks in the house, busy for a while, giving you some well deserved break. 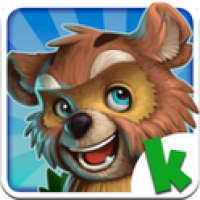 The game was created by Kiwi Inc, a developer that really garnered impressive download figures with their previous game, Monster Park. Brightwood Adventures is an RPG game, but this time around it is for the kiddies and they are sure to love it. Nothing very complicated; no confusing controls, everything is nice and smooth. The main objective of the player is to build a wonderful village located in the Dark Forest with the help of Wally, Rowan, and the rest of the gang. This is a typical management game, a really complete adventure in which the user should explore the dark forest and help the villagers feel comfortable in their new home. On shooting up the game for the first time, a tutorial will explain everything on how to go about the game, and the ways to collect rewards and various awards. Overall, the game comes with some neat graphics, playable missions, cute characters and everything that would keep the kids smiling. Being free, the in-app purchases are part-and-parcel of the package, but nothing that is forced upon the user.